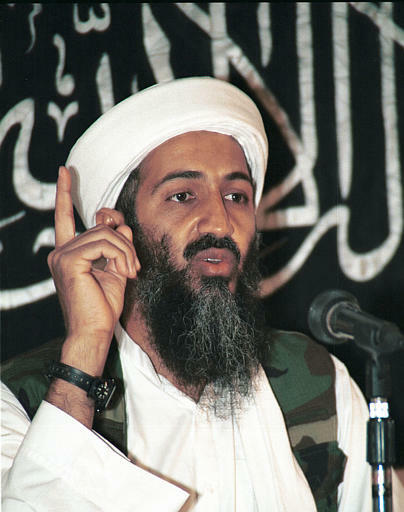 On the day of December 13, 2001, the U.S. government released a so-called authentic videotape of Osama Bin Laden confessing to being responsible for the 9/11 terrorist attacks. 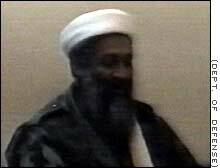 However, after examining the entire video, it has one major flaw: The man confessing in the video isn't Osama Bin Laden. Please look at each picture carefully: E at the bottom right corner is almost certainly a fake one. The administration says it went to great lengths to determine that the tape was authentic." White House spokesman Ari Fleischer said the tape was found in a private residence in Jalalabad, but he declined to say just how the United States came to possess the tape or what it knew about who shot it and when it was recorded." 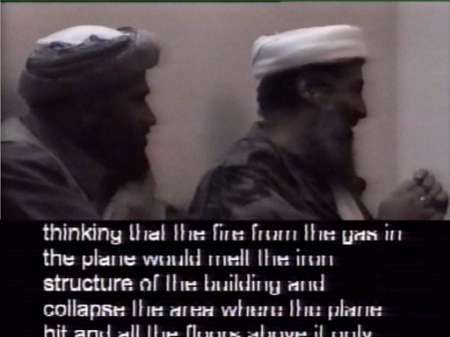 The tape's release is central to informing people in the outside world who don't believe bin Laden was involved in the September 11 attacks,' said Sen. Richard Shelby, R-Alabama, the vice chairman of the Senate Intelligence Committee. 'I don't know how they can be in denial after they see this tape.'" It's not going to convince everyone. You will always have some skeptics out there. But it will strengthen the view of those who have thought all along that bin Laden and al Qaeda had been involved,' Dergham said. 'I think that the level of denial will decrease.'" They said they found the videotape in a private residence in Jalalabad, although they cautioned the nature of its discovery was more complicated." Released by the Pentagon on December 13, 2001. Television images released by the Pentagon. 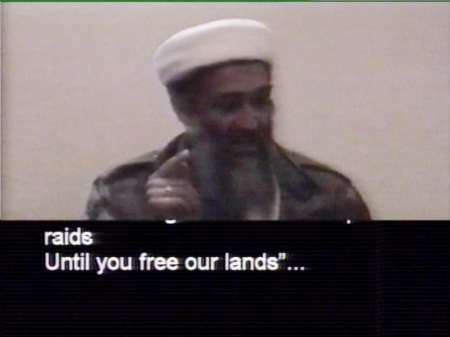 Note: "OBL" is Osama bin Laden speaking. 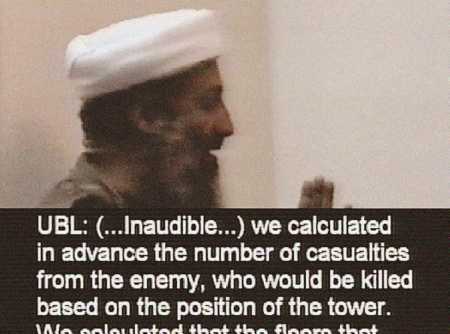 comments were video taped with the knowledge of Bin Laden and all present. meeting, but does convey the messages and information flow. Shaykh: (...inaudible...) You have given us weapons, you have given us hope and we thank Allah for you. Allah and the blessed fruit of jihad. OBL: Thanks to Allah. What is the stand of the Mosques there (in Saudi Arabia)? OBL: The day of the events? time. I visited him twice in Al-Qasim. OBL: Thanks be to Allah. victims). He swore to Allah. This was transmitted to Shaykh Sulayman Al ((‘Umar)) Allah bless him. 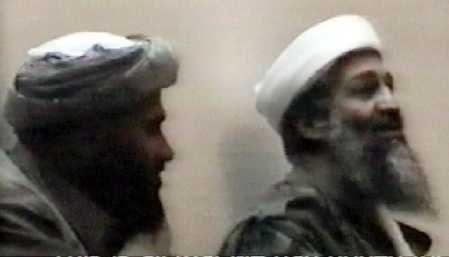 OBL: What about Shaykh Al-((Rayan))? 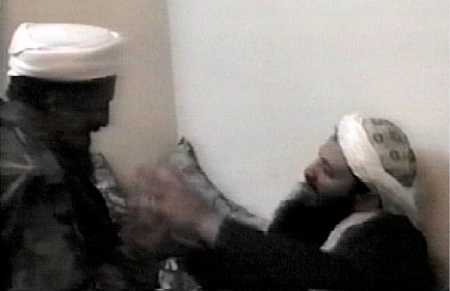 OBL: Allah bless you. You are welcome. clean and we are very comfortable. made people think (about true Islam) which benefited Islam greatly. Shaykh: Hundreds of people used to doubt you and few only would follow you until this huge event happened. this vision a year ago. This event discriminated between the different types of followers. based on the position of the tower. We calculated that the floors that would be hit would be three or four floors. plane hit and all the floors above it only. This is all that we had hoped for. just hit the World Trade Center. who heard the news were overjoyed by it. is going to turn and hit them back." And it is a mercy for us. And a blessing to us. And it will bring people back. Islam and the resistance of the wicked people. 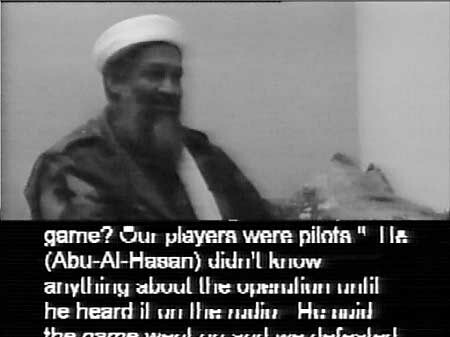 Second segment of Bin Laden’s visit, shows up at the front of the tape. a good omen for us. plane crashed into a tall building. He knew nothing about it. the Egyptian family (meaning the Al Qa’ida Egyptian group), was in charge of the group. one of the pious men in the organization. He became a martyr. Allah bless his soul. She saw the plane crashing into a building...that was unbelievable, my god. we asked each of them to go to America but they didn’t know anything about the operation, not even one letter. heard recounting his dream about two planes hitting a big building). 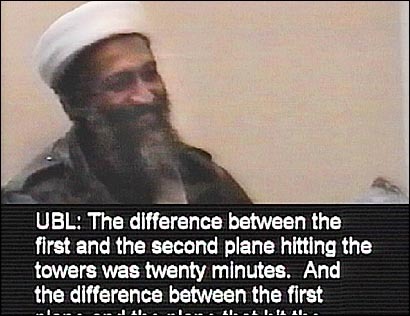 OBL: They were overjoyed when the first plane hit the building, so I said to them: be patient. difference between the first plane and the plane that hit the Pentagon was one hour. 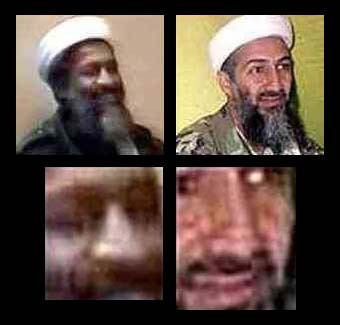 Osama's face is wider at the eye level. 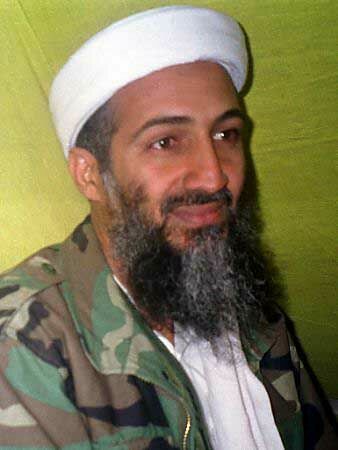 Osama has a much taller and narrower nose.